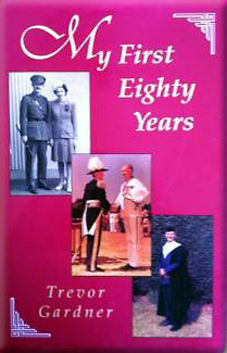 Trevor Gardner's autobiography My First Eighty Years is as truthful and upright as its author. Sadly, he did not see his book published. It divides itself into three sections: the Army and the War; D.O. and Finance, in Northern Rhodesia; then financial administration at Cambridge. The Army suited the author well. He was a serious, naturally disciplined character, always by nature well tumed-out. Through no fault of his, an accident to his foot early on, he did not see action; he was valuable as a staff officer and member of AMGOT (Allied Military Government, Occupied Territories). Enchanted, seduced, as many of us were, by Kenneth Bradley's Diary of a District Officer, Trevor Gardner found himself in 1946 in the very same area of the Eastern Province. More, he had the privilege of serving under the tuition of some of our best D.O. 's - Ronald Bush, Douglas Hall, Robin Foster, and with our unique home-grown eccentric, Christie Lawrence. He did well, and enjoyed the life. Of course we all somewhat romanticised the history of our Chiefs, perhaps because there was so little history about; but to swallow Chief Kawaza's tale that his people were in fact a lost impi split off from Lewanika stretched the bounds of credulity to their outer limit. He and his people were ordinary, industrious Chewa. To put anything like this one over Trevor Gardner later would have made various financial experts envious. Indeed, there must have been joy in Heaven when he detected two casting errors in the Auditor-General's own accounts. At all events the photograph of him in camp reveals a clearly happy and useful field D.O. Artlessly, he boasts of having passed his Ci-Nyanja exams with distinction. However in those carefree years the spectre of Federation stole up on us. At this time Trevor Gardner was swallowed up by the Finance Division of the Secretariat, where he spent the rest of his working life in N. Rhodesia. More's the pity, as another tour in the bush as D.C. would have made him appear less stiff, more friendly, even. It may be helpful to try to explain here how the Federation appeared to junior officers on the ground, from 1950 to 1953. We, cadets and D.O.s, worked round our Districts under such fine men as Bush and Hall to try to sway Chiefs and Councillors to acceptance and support. All in vain. African opposition, expressed with respect but with great force by the Chiefs, was as Gardner puts it "pathological". Nor were we, the Administration, altogether disinterested. Our loyalties basically were identical to those of the Chiefs, to the memory of Queen Victoria; and we were her present Majesty's faithful servants. We never trusted Southern Rhodesia. We thought the Native Commissioners no more than civil servants who jumped to every Central Government command. Rather we were administrators in the tradition of Lugard, imbued by the grand Margery Perham. Also a great stretch of the Empire was still open to us for posting. Southern Rhodesia kept its people in Africa for leave, while our conditions were generous on an imperial scale. Under Federation we should soon be cut off (goodbye Union Castle!). No-one re-assured us about this - certainly not dry little Sir Gilbert Rennie. Many years later, when it was all over and Rhodesia had fallen, Ian Smith explained Rhodesia's tight rein to me. "Well, you have to have discipline, you see". I did not pursue an argument with that lonely and gallant figure. But we did not need, in widely flung Districts, that narrow discipline which a civil service ministry, by its nature, strives to impose. A discipline of paper and frequent Returns. During the Federal years Gardner had an inside view of the politicians, local and imperial. Finance was much of the key to success or failure. His observations are shrewd and far-seeing and his judgements of men and events are of great historical interest. However, he is mistaken in labelling his Governor, Sir Arthur Benson, as "brash" and a "maverick". Their casts of mind differed profoundly; but while history will pronounce Trevor Gardner a master of the figures, no doubt. Sir Arthur was master of the field, and of men. The Financial Secretary was easier with the passive Sir Evelyn Hone. As all of us, he liked his own way. The last section of the book covers Trevor Gardner's work as Deputy Treasurer and Treasurer of Cambridge University. Worthy, yes. But it lacks the interest of the first two. He may describe Cambridge politics as "Byzantine", but if so, he does not offer us a single decent murder. Nor do the ghosts of C.P. Snow's intriguing dons flit or shuffle in the cloistered courts at twilight. Sadly it must be said.- "L'secret d'ennuyer, c'est de tout dire". At Cambridge, Gardner was a dynamo of beneficent activity. The Fitzwilliam, Kettles Yard and the Cambridge University Press are just three institutions which are beholden to him. At one stage he sat on one hundred and twenty committees, prompting a rare flash of wit from the author, who says: "A committee should consist of uneven numbers, of which three is too many". He earned the gratitude of the University, past and future, by his sturdy resistance to the more brutalist architecture of the 1960s. He did know, by then, a Byzantine twist or two. More than just a good book-keeper, Trevor Gardner could and did take long views. He kept the Philistines at bay, within and without, at Cambridge: there were always plenty of those running around. If he appeared to us a dry stick, he understood the biblical injunction that unless a house is builded upon rock, it cannot stand. The new Africa, which he saw and lamented, had the magic quality of turning his rock to sand. He passes it by in two pages. He doubtless ended a full life, having exercised ability and authority, and satisfied, as we all were for him, that he had done his utmost in his time.